This pretty much had to happen. 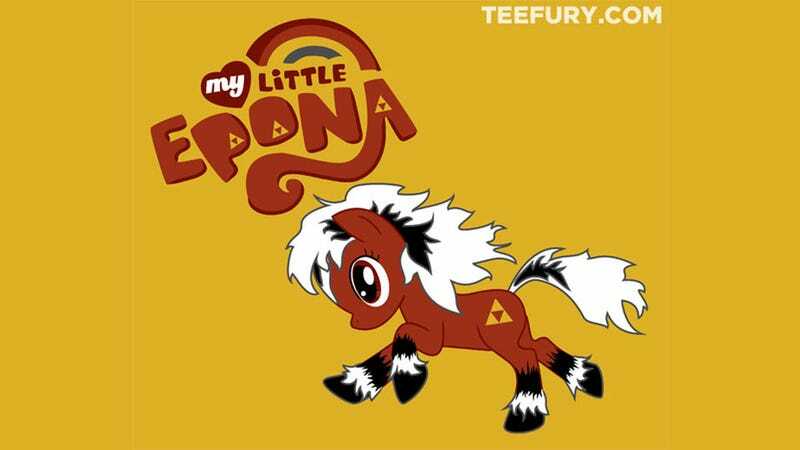 If this irresistible crossover doesn't become the best-selling t-shirt in TeeFury history then everything I believe in and hold dear is a lie. Artist Julia "JellySnail" Whittle combines the magic of The Legend of Zelda with the magic of friendship to give birth to My Little Epona, a golden wearable sandwich cookie filled with wonderful things. It's available for one day only at the original short-attention-span t-shirt shop, so grab it now or forever kick yourself every time you see me wearing it. Or I can kick you, either way. That's what friends are for.